At the end of the day, it looked like the Tigers made a game of it, but they simply couldn’t overcome Shane Greene’s (11 GS, 60.2 IP, 5.19 ERA, 4.53 FIP) disastrous outing. Greene gave up five homers and seven runs in fewer than two innings, but the bullpen did their job, holding the Angels to just one additional run the rest of the way. They pecked away after a Yoenis Cespedes homer and Kinsler ended his homer-less streak, but the six runs didn’t measure up. They’ll try to avoid a sweep with David Price (10 GS, 66.2 IP, 2.97 ERA, 3.29 FIP) Sunday night. The Moment: Cespedes mashes one. Optimism is good. It’s usually a good quality in a person, and writing pessimistic things provides me with no joy. I’d love to be writing a different piece, in which I laud the positive changes made by Nick Castellanos so far this year, but unfortunately, the reality of the situation precludes that. Even with a small sample and noisy defensive stats, everyone is pretty much in agreement that is defense is better, even if it isn’t great. The problem is that getting his defense above water was only part of the equation for the 23 year old’s development for 2015. We knew he wasn’t ever going to be a gloveman, but we expected the bat to flourish if given time. As we check in at the end of May of Year 2, the signs of growth are nonexistent. Let’s start with the basics. The strikeout and walk rates aren’t better. The power is up the slightest bit, and the overall results are down. Nothing about that gives you confidence, but baseball can be weird, so let’s dig a little deeper on the plate discipline. Okay, so more swings at pitches outside the zone; bad. You’ll also notice pitches are throwing far fewer pitches in the zone. And that’s what has me worried. The goal should be to swing at less junk to force the pitcher to either walk you or to throw you better pitches. Nick isn’t doing that. Let’s get even finer. Using Bill Petti’s Edge%, you can see pitchers learning to expand the zone. Pitchers are living on the edge and in the heart less in favor of more pitches outside the zone. This isn’t a bad thing inherently, but you would want to see this matched with fewer swings. It would be one thing to swing more at more strikes, but it’s going the wrong way. So what does this all mean? I’m the last person to bury a young player because they don’t reach their potential early. And Castellanos clearly has a high aptitude when it comes to the game’s hardest skill. The problem isn’t so much that Castellanos is still struggling to find his footing, the problem is that he doesn’t seem to be improving at the part of the game that is very obviously holding him back; strike zone management. This is kind of a soft comment, but I think the biggest difference between non-superstars who stick and those who don’t is the ability to come to terms with the pitches they cannot hit. 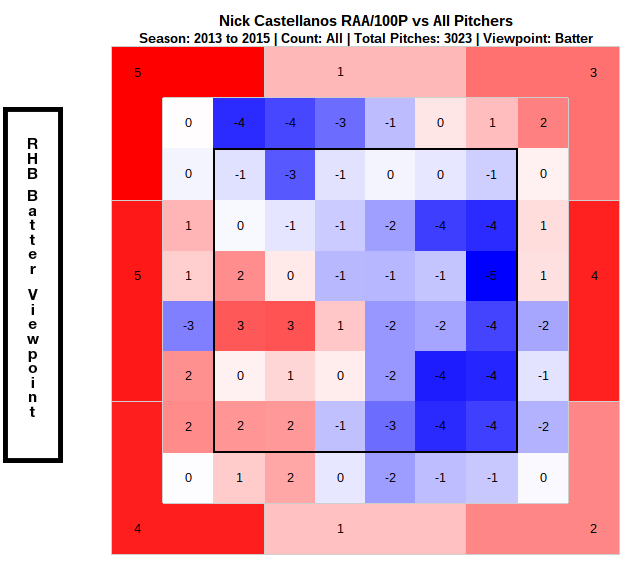 For whatever reason, Castellanos is much better on the pitch inside than the stuff away from him and down. I’m not an expert on swing mechanics, so I have no idea how much he can fix that problem, but he at least has to be able to recognize it as a deficiency and alter his behavior accordingly. I don’t expect him to just learn to hit those pitches better, but it’s not too much to ask that he stops swinging at them. That’s what I’d be looking for over the next four months. It’s not the Castellanos has to be good right now. He’s 23 and has lots of time to get it right, but it is somewhat concerning that there’s no forward progress this year. I don’t really care if he’s not BABIPing into hits or if he hasn’t hit for enough power at this age, but you want to see a guy identify a problem and work on it. And that isn’t evident in the results. So either he hasn’t worked on it or he doesn’t have the tools to correct it. Both are concerns. It’s still early in the season and in his career, but the absence of good news is slowly starting to matter. So this started off ugly with a pair of early homers off Buck Famer (1 GS, 5 IP, 12.60 ERA, 8.52 FIP), then it calmed down, and then against all odds managed to get worse. Nesbitt and Gorzelanny couldn’t quell the uprising and the team let it get out of hand in the later innings, but it was over long before that. Anibal Sanchez (10 GS, 60.1 IP, 6.12 ERA, 4.43 FIP) will try to end the curse of the Angels on Friday. The Moment: Kinsler works to very long PA. If you said, “hey, I bet the Tigers bullpen could win an entire game,” entering this season, collect your prize. Alex Wilson and Kyle Ryan combined for a great start to set up the Yoenis Cespedes three run home run in the 5th that proved to be the difference. It got a little dicey as the A’s grabbed a run in the 7th and 8th and threatened in the 9th, but the Tigers held on and secured a series win on a day in which Dixon Machado grabbed his first MLB hit. It wasn’t the cleanest series but the Tigers won twice against a solid team (ignore their record, mostly). They’ll head south to LA to take on the Trouts on Thursday starting with Buck Farmer (2015 Debut). The Moment: Cespedes turns on one to score three. The Tigers got their only run two batters into the game. It was the only run either team would score all night. David Price (10 GS, 66.2 IP, 2.97 ERA, 3.31 FIP) surrendered contact, some of it was hard, but he managed to deliver seven shutout innings of baseball before turning it over to the Joba-Gorz-Soria tandem, including four outs from Joakim Soria. Thankfully, the first 10pm start for the Tigers was a quick affair, courtesy of neither team’s offense really doing very much. Someone, probably Kyle Ryan (2015 Debut) will start Wednesday in place of Simon. The Moment: Gose scampers around the bases in the first. Today felt like the boiling point for a lot of the Tigers’ fan base. The team lost their third straight game. They fell into third place behind the Twins. They hardly got any offense going against Jesse Hahn a day after giving away a game in which they led 7-3. There were double plays. The panic is arriving in #PanicTown. The Tigers are 15-18 since starting 11-2. They seem to hit into five double plays a game. I get that you’re frustrated and you can feel however you want to feel. But there is no reason to panic. In fact, you should be pretty happy about where the Tigers are for several reasons. The Tigers are Playing at a 92 Win Pace. I don’t like to play the on pace game because you always want to include regression to the mean, but the Tigers are playing at a 92 win pace. Most objective projections of their talent level forecasted them in the 85-89 win range. Now granted, no projection is perfect, but those projections expected a healthy Victor Martinez and included a mostly healthy Verlander. The Tigers, by any possible measure of full season win expectation, are ahead of their expected win total. There’s more to discuss, but even if you’re pissed off at the way the Tigers have played so far, you can’t rationally blame them for the 15-18 under-performance and not give them credit for the 11-2 over-performance. Baseball is chaotic. Streaks happen. Maybe you haven’t liked what’s happened in the last couple of weeks, but on balance, the team has been more successful than they should have been so far. I’ll be the first person to tell you that the bullpen will not be this effective for the next four months, but good bullpen performance and good defense allows you to squeeze a little extra out of your roster because you don’t lose as many 50/50 games. In fact, if you go by UZR, the Tigers are the second best defensive team in baseball so far. By DRS, they’re 8th. The bullpen’s ERA is good lately, but they’ve also done fine through more advanced metrics like FIP and RE24. In previous seasons, we’ve been complaining that the bullpen and defense would blow games the team should win, but this year, they’re not blowing as many of those games in those ways. Expect some regression to the mean, but the defense is absolutely much better than in years past and that will help them avoid some extra losses. This is the third best offense in baseball, still. It’s the Dodgers, Royals, then the Tigers at 111 wRC+. That’s context neutral. It’s a measure of offense that doesn’t pay attention to the order of the events. In other words, the reason the Tigers aren’t scoring more runs is because they’re not getting their hits in the right order. Consider this inning. Single, ground out, home run, single, strikeout, fly ball. If that happens, you score one run. Now consider this inning. Single, single, home run, ground out, strikeout, fly ball. If that happens, you get three runs. 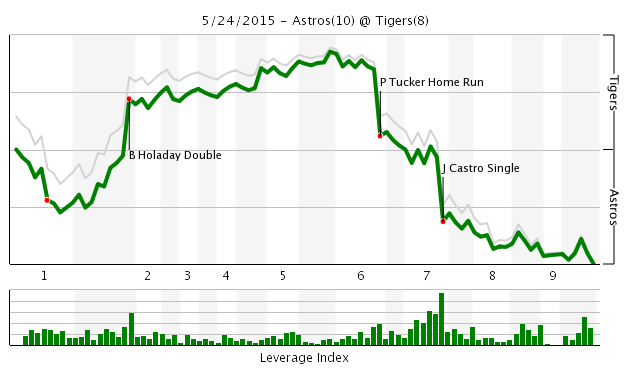 On average, those outcomes will yield 2.5 to 3 runs in an inning, but sometimes they don’t just because of the order. In both cases, you hit a home run, two singles, a ground out, a fly out, and a strike out. Identical innings on a per PA basis. But the order matters in terms of how many runs you score. And listen, I know you don’t believe me when I say this, but teams cannot control the order in which those hits occur. You can order your lineup a little better, sure, but basically there is no way to will yourself to get hits with men on base rather than with the bases empty. It’s just not a real thing. The Tigers happen to be hitting their ground outs at horrible moments so far this year. The great part about this is that it will almost certainly change. Granted, it’s a GIDP kinda club because they’re on base a lot and are sort of slow, but the luck will even out. Pay attention to the overall quality of the bats rather than the random ordering of the outcomes. If they keep hitting like this, they will score more runs. Verlander is coming in a couple of weeks. Rondon is coming. Either Victor Martinez will come back or they’ll continue to use a DH who will hit better than the Victor we saw to start the season. I would imagine Sanchez will straighten himself out. Presumably Castellanos will hit better. Of course, Gose and Iglesias will hit worse than this, but the balance of the corrections should help the Tigers a little bit. Even if you’re one of those people who believe in the Royals Magic, if you think they’re a 103 win team you’re being silly. If the Royals win 103 games, there was nothing the Tigers could possibly do about it. Same for the Twins. You can’t control what the other 29 teams do for most of the season and if you’re judging your team based only on how they stack up against the teams that happen to be performing very well at the moment, of course you’re going to be upset. This happens almost every season. The Tigers are in the midst of a slightly below average stretch of baseball. It happens. The problem with this for most people is that most people don’t realize that every team goes through the same thing. You’re so plugged in to the rhythm of your team that you don’t realize how often other teams go through terrible stretches of baseball. If the Tigers had started 15-18 and then gone 11-2, you would feel super good right now. But those seasons are identical. They’re no different. Same record of performance. You’re weighted the early games less than the most recent ones because you think this week is a better indication of how good the team is than than the last 46 games and that’s just a trick your mind plays on you. The order doesn’t matter. This is the same team you were excited about on April 20th. Nothing really changed about the outlook of the team, but your mood shifts on a day to day basis. That’s fine when we’re talking about whether you’re happy with any single game. That’s natural. But when you take a step back, there’s no reason to worry more today than you did four weeks ago. It’s a solid team. They’re doing well this year. There are flaws, but they are not yet under-performing. There is no need to panic even if you really, really want to. In general, allowing four runs against the A’s isn’t a particularly poor showing, especially considering the stars aligning for a Billy Butler infield single. The full line doesn’t look great for Shane Greene (10 GS, 59 IP, 4.27 ERA, 3.49 FIP) but he gave the offense a chance to make it a game. Unfortunately, the Tigers bats didn’t get anything going all afternoon. They had two men on just once today and promptly grounded into a double play. You’re never surprised when the bats are quite after a cross-country-flight-day-game combo, but after a couple of hard losses, it might feel a little worse. David Price (9 GS, 59.2 IP, 3.32 ERA, 3.35 FIP) will look to change the tune on Tuesday night. The Moment: Castellanos makes a find sliding grab in the 3rd. I think this just about says it all. Anibal Sanchez (10 GS, 60.1 IP, 6.12 ERA, 4.44 FIP) struggled in the first, got back on track, and was then left in until he broke. The bats did their job to rally back, but they couldn’t prevent runs. You’re okay losing a game in which the starter didn’t perform well, but when get yourself to a 7-3 lead in the 6th, you have to wonder if they didn’t give this one away. Shane Greene (9 GS, 53.1 IP, 4.05 ERA, 3.65 FIP) takes the ball out west. The Moment: Holaday clears the bases in the first.